There is a lunar eclipse coming the end of this month, and depending on who you ask it is significant for different reasons. In fact, there has been a lot of hype about this particular eclipse (or rather, series of eclipses) in some Christian circles with the term “blood moon tetrad” often being used in conjunction with prophetic claims. I’m certainly not a specialist in Biblical prophecy, interpretation, or the history of Israel, but I can unpack some of the sensationalized terminology here and help sort out the science behind the hype. Let’s start with the term “blood moon.” The popular press has recently started using this term to refer to a lunar eclipse. Lunar eclipses happen quite frequently, usually twice a year, when the full Moon passes into the Earth’s shadow. This causes the Moon to fade in brightness over the period of a couple hours and often take on a deep red hue due to the Earth’s atmosphere and the way it scatters light. Consider how the sky looks during a sunset: even though the Sun is hidden beneath the horizon, the atmosphere bends the red portions of sunlight toward us. From the Moon, during a lunar eclipse, the Sun is hidden behind the Earth. The glow of a ring of sunsets casts that red light onto the Moon’s surface, making it appear duly reddish or “blood red.” This effect can be heightened if the Moon is near the horizon, depending on atmospheric conditions. So what about “tetrad”? There are different types of lunar eclipses. If the Moon only moves partly into the Earth’s shadow, it’s called a partial lunar eclipse. The eclipse of this month is the last in a series of four total eclipses, in which the Moon passes through the darkest portion of the Earth’s shadow. 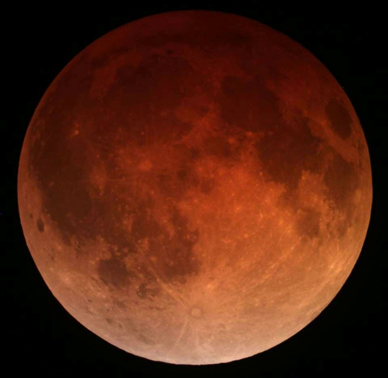 A series of four total lunar eclipses without any partial eclipses between is known as a tetrad. This current tetrad includes the total lunar eclipse of last April as well as the eclipses of April and October of last year. How rare are such series of eclipses? Glancing through my copy of NASA’s huge “Five Millennium Canon of Lunar Eclipses,” which included information on all lunar eclipses from 2000 BC to 3000 AD, I see that over the past thirty years there was a tetrad in 2003/2004 and 1985/1986 (as well as several lunar “triads”). According to the website EarthSky.org, there will be eight tetrads in the twenty-first century, while the years 1701 to 1899 had none at all. There were five in the twentieth century. So what does this all have to do with Biblical prophecy? According to some sources, this particular tetrad is unique because it lines up with specific Jewish holidays. Last year, the first lunar eclipse of the series fell during Passover, as did the eclipse of April of this year. Last year the October lunar eclipse was during Sukkot, or the Feast of Tabernacles, which again corresponds with this month’s eclipse. The important thing to remember though is that the Jewish calendar (unlike ours) is a lunar calendar; its months correspond with the actual phases of the Moon. Both Passover and Sukkot begin on the fifteenth day of the Jewish month, which usually corresponds with the full Moon. And because lunar eclipses only happen when the Moon is full, it’s not strange there would be occasional line-ups between these holidays and a series of lunar eclipses. How occasional? Again, according to EarthSky.org, this has happened eight times since the birth of Christ. And here’s where the prophet interpreters come in, offering links between the years in which a tetrad of lunar eclipses corresponded with these holidays and important events in the history of Israel. But that’s the problem: history is a complex, messy business, and the human mind is hard-wired to find patterns everywhere, even where they don’t exist. Plus, these “significant events” are subjective: how widely do you want to interpret what events are actually important? The tetrad of 1493-1494 is linked to the expulsion of the Jews from Spain, for instance, but the order for the expulsion wasn’t signed in these years and the persecution lasted for decades. Making 1493-1494 especially significant is arbitrary. And other events that would seem to be significant are ignored: there was no lunar tetrad, for instance, during the Holocaust. Finally, I should add that this whole claim of prophetic significance is offered by individuals outside the Jewish community with little insight or regard into what that community would actually consider culturally or historically important in their own past. The full moon rises in the east at sunset that evening. By 9:15 the Moon has begun to enter the darkest portion of the Moon’s shadow, marking the most vivid phase of the eclipse. It will be at its darkest at about 9:45, and the moon will begin to emerge from deep shadow at about 10:20. The Moon will not be completely out of the Earth’s shadow, however, until after midnight. As far as visibility, this will be an easy lunar eclipse to observe—taking place when the Moon is high in the early part of the evening. (Last year I had to make students get up before dawn to spot the eclipse.) So definitely take the opportunity to wonder and ogle, but try not to prognosticate. This column first appeared in the Kankakee Daily Journal, August 28th, 2015. This entry was posted in Writings and tagged astronomy, blood moon, column, Daily Journal, eclipse, Kankakee Daily Journal, lunar eclipse, moon, prophecy, tetrad, writings on September 12, 2015 by boldsaintcroix.